Energy Trust of Oregon updates its incentives annually to ensure they remain cost effective. The following tables focus on all professionally installed insulation incentives and requirements which were effective on January 1, 2019. To download complete copies of Program Incentive Guides, please visit the Insider forms page. NW Natural, Cascade Natural Gas, and Avista. Rentals only, either fuel If R-11 or less, insulate to R-38. Must be installed with qualifying attic insulation installation. If R-4 or less, insulate to R-11 or fill cavity. All heated exterior wall surfaces must be insulated. If R-4 or less, insulate to R-11 or fill cavity. All heated exterior wall surfaces must be insulated. Rentals only, either fuel Must be installed with qualifying attic insulation installation unless home is not site-built. If R-0, insulate to R-30 or fill cavity. 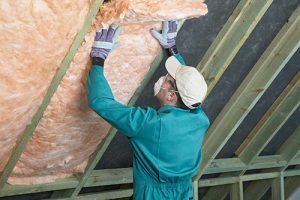 Insulation incentives are available for single-family homes. Floor insulation If R-0, insulate to R-30 or fill cavity. For more information incentive changes and effective dates, contact the Home Retrofit Trade Ally hotline at 1.866.365.3526 or residentialta@energytrust.org.